Welcome back to school Geographers! 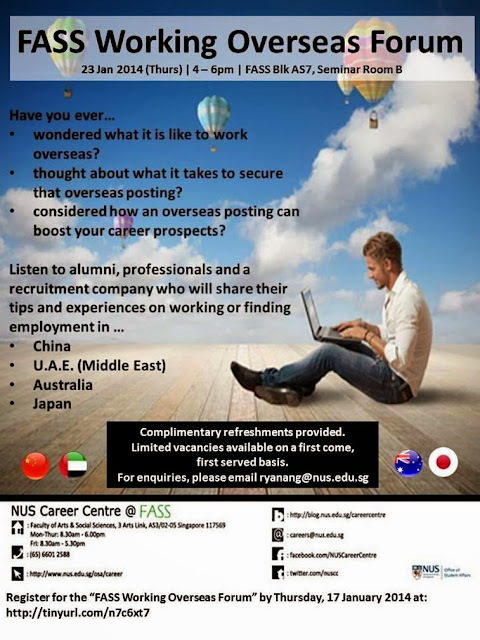 For those interested in working overseas, feel free to head down to FASS Blk AS7, Seminar Room B on 23 Jan 2014, 4-6pm, for a FASS Working Overseas Forum. This is organised by the FASS Dean’s Office and NUS Career Centre featuring FASS alumni and invited guests. They will be sharing their overseas working experiences (the good and bad, and what to watch out for). One of the speakers – Ms Sandra Leong (Singapore Tourism Board) had worked in Sydney for a number of years – is a Geography alumni too! If you have any questions pertaining to working overseas, this is the perfect chance to clear your queries! Do see the picture attached for more information and register at http://tinyurl.com/n7c6xt7 if you are interested. Have a great week ahead and we look forward to seeing you all in the exciting events lined up for this semester!